Can you recommend a plain English introduction to power analysis? The analysis of statistical power is an essential skill for anyone who relies on tests of statistical significance. Yet the majority of text books say nothing about it. In this plain-English primer, you will learn how to avoid the many problems that arise from misunderstanding issues of statistical power. Using simple FAQs and a class-tested approach characterized by easy-to-follow examples, Statistical Power Trip will provide you with the tools you need to design studies that work. 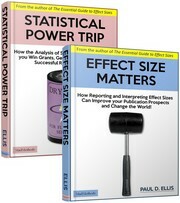 Statistical Power Trip is a 55 page e-book. If you’re looking for something a little more substantial but still written in jargon-free language, I recommend The Essential Guide to Effect Sizes. This entry was posted on Sunday, May 30th, 2010 at 11:55 pm and is filed under power analysis. You can follow any responses to this entry through the RSS 2.0 feed. Both comments and pings are currently closed.